Sakura Paribahan is one of the best transportation services in Bangladesh. They have been running their business since 1991. The service has a 24/7 customer care center which lets you complain against or advice for them. 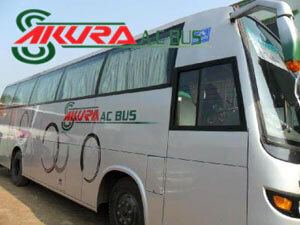 Sakura Paribahan offers non-AC bus service for the passengers. The company mainly maintains four routes such as Barishal, khepupara, Barguna, and Mothbaria. AC bus service can also be added soon with the existing buses. You can contact the main office over the mobile. The official mobile numbers of Sakura Paribahan are 01727545460, 01746474780, 01700558805, 01992797701.you can get Sakura Paribahan service information by calling to the counters. You can book or buy seats from the counter. The head office is in Gabtoli. The fare from Dhaka to Barisal is TK 500 per person. The fare is same for Dhaka to Khepupara, Barguna or Mothbaria. You have to pay TK 550 for any of this destination. Per person fair for Dhaka to Jhalokathi is TK 500. You also have to pay TK 600 for Patuakhali or Kuakata. Unlike others, Sakura Paribahan non ac bus gives you the feelings of flying in the sky. * Passengers should reach at the bus stand at least before 20 minutes. * Every passenger can carry the luggage of maximum 10-kilogram weight with him/her. An additional charge will have to give in the case of more than 10 kg weight of luggage. * Passengers cannot carry illegal goods with him/her. In the case of carrying illegal goods, the authority is not responsible for that. * Smoking is not allowed on the bus. * Passengers should take a token after giving their luggage in bus bunker and keep that token safe for receiving their luggage back. Handbags and other goods in the bus, passengers have to keep under their own responsibility. * If passengers come late at the bus stand and miss the bus, transport fare will not be given back to them. You can’t go outside of Bangladesh directly from the above districts as Sakura Paribahan has no international service. You can use Shyamoli Paribahan service for this purpose. But you can save your time and money by buying a ticket from online using shohoz.com. Sakura Paribahan opened the service in 1991. Since then, it runs the business by maintaining superior customer service. They try their best to give the passengers best experiences. Sakura Paribahan is a milestone for the communication system for the districts near the Bay of Bengal as Desh travels for northern Bangladesh.